Williams 7-0 (4 KO’s) isn’t being cocky. He is a student of the sweet science and has a keen understanding of how the sport of boxing works. Williams has respect for any fighter willing to get into the ring and he knows on any given night when two fighters have done everything possible in the gym to prepare for a fight, a lucky punch can happen. But, not on November 16. Williams knows what is in front of him and is ready for the challenge. “I respect the fact that Jules is undefeated, but he isn’t even as good as the guy I faced in my pro debut. I am ready for him. He is more worried about me than I am of him, and face it, he has no power,” said Williams. 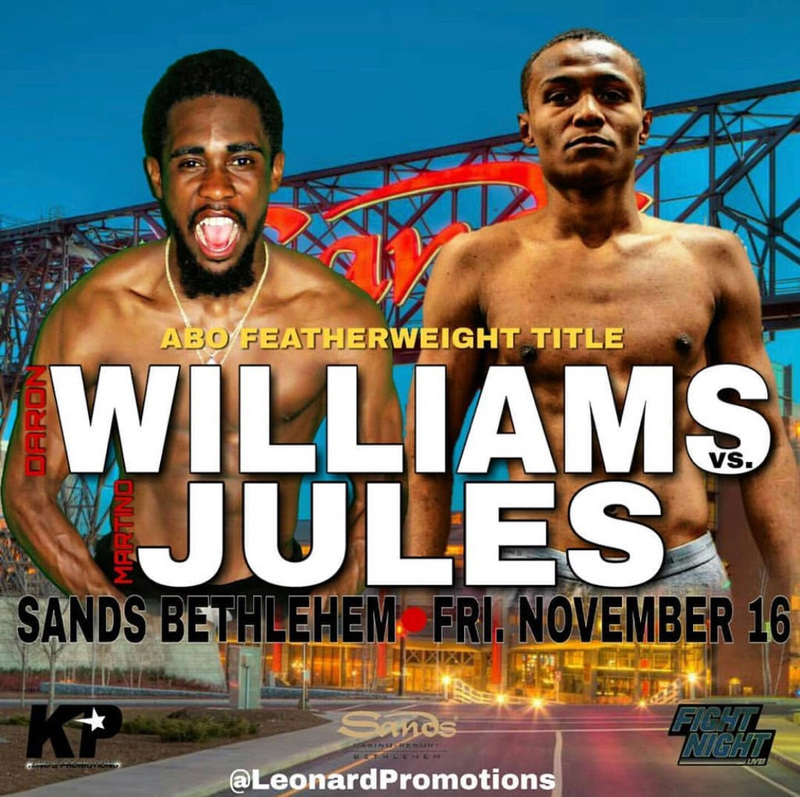 Jules 5-0, who lives approximately seven miles from the Sands Bethlehem Events Center, will be making his fifth consecutive appearance in front of his hometown fans. In his four previous fights at the Sands Bethlehem Events Center, he has outpointed his opponents three times by UD and won one by Majority Decision over Weusi Johnson. Jules will be fighting to reach the hometown scorecards. Williams is unfazed about anything that can possibly go wrong fighting in Jules’ hometown. Williams has an incredible belief in his talent, work ethic, and team. “I have a great team in Mychal Thomas, Dr. Jonathan Davis, and Kenny Leonard. We are a family with one goal, and everyone is happy. Sugar Ray Leonard takes an interest in what we are doing. You can’t beat that. They are there for me. I really can’t put it into words how much their support means to me, but I can show my appreciation by getting in the ring and giving them a great show. That is how I show my appreciation.” Daron “Sweet Tay” Williams. On November 16, Daron Williams will do what he does best, win. But, this time, he will be collecting more than just a win. He will be looking to add the ABO Featherweight title to his list of wins and fighters he has forced to retire. Six of Williams’ previous opponents stopped fighting after they felt the wrath of “Sweet Tay” Williams. Will Martino Jules be next and will the ABO title be the first of many for Williams? Tune in Friday, November 16, 2018, to find out why Daron “Sweet Tay” Williams might be the sweetest of them all.